Find hotel near Light Tackle Adventure Ta ..
Puerto Rico has long been known as one the best places in the Caribbean for fishing, and Light Tackle Adventure Tarpon Fishing in Cabo Rojo is a great place to check out the activity for yourself. 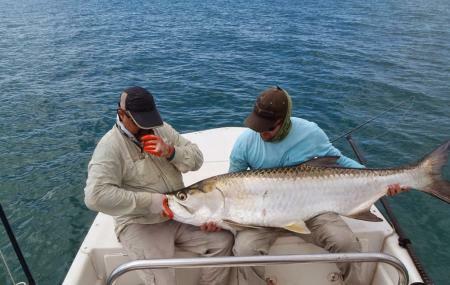 They specialize in providing the best catch and release fishing experience in the area, concentrating on catching the huge Tarpon fish that inhabits the waters around Puerto Rico. It is situated in Boqueron Bay, which is a fisherman’s haven, and you can also catch other types of fish like snapper, jacks, snook and ladyfish. Run by an able fisherman by the name of Captain Ponchy, Light Tackle operates in a number of areas in Costa Rica. In Cabo Rojo, you take off from Boqueron Bay, and will be snagging fish within minutes. The crew are very well qualified and give you expert tips on catching fish and holding on to them too. It goes without saying that you might need to hold on dearly to a large catch, but the elation of capturing your first bait is truly thrilling. The operators make their own baits, different and colourful, which you can purchase and take home as souvenirs. The boat is very well equipped, armed with a 14 rod holder, a marine radio, a flare kit and a fire extinguisher. Head on down to the Light Tackle Adventure Tarpon Fishing Company for an adventure with a difference! You may have done water sports, and you may have done white water rafting, but this is a unique experience for all adrenaline junkies. The company provides you with bottled water, fishing gear as well as a saltwater fishing license. You are instructed not to bring any GPS equipment on the boat. Shoes worn aboard should have light coloured soles so as not to mar the deck of the boat. Prices start at $300 for ½ a day (4 hours). You can avail discounts on packages with bigger groups. How popular is Light Tackle Adventure Tarpon Fishing? People normally club together Paradise Puerto Rico Water Sports and Miski Mikuna while planning their visit to Light Tackle Adventure Tarpon Fishing.